Pizza with tomato sauce? 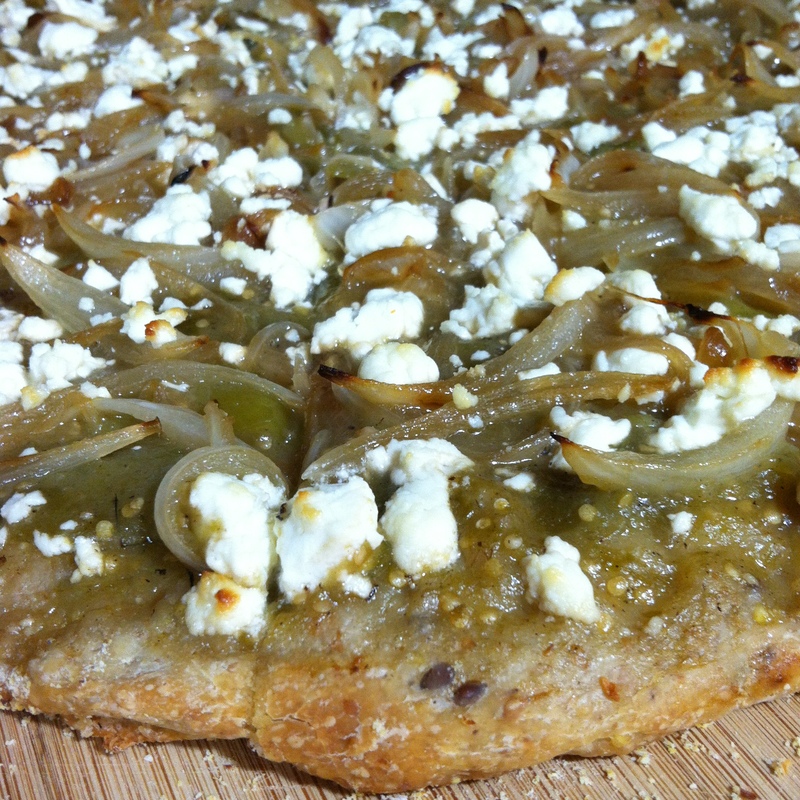 How about pizza with tomatillo sauce? I’ve only ever used tomatillos to make salsa. That is, until I discovered that when you slice them and heat them in a pan, they reduce to a thick and sweet sauce that pairs perfectly with other veggies and – my favorite – goat cheese. This sauce puts a fun spin on pizza. It makes it a little sweet but it’s definitely tasty and a really good summer pizza. I busted it out on a hot day for a pre-dinner appetizer and it was a hit! About 1-2 tablespoons whole flax seed. Gives the dough a little crunch and healthy boost! Pre-made or homemade pizza crust. If you make your own, I highly suggest using this recipe from my cooking idol Smitten Kitchen. Stir dry ingredients, including yeast, in a large bowl. Add the water and olive oil and stir until formed into a ball. Knead well and place in a well-greased bowl with a damp towel covering it for 1-2 hours until it has doubled in size. 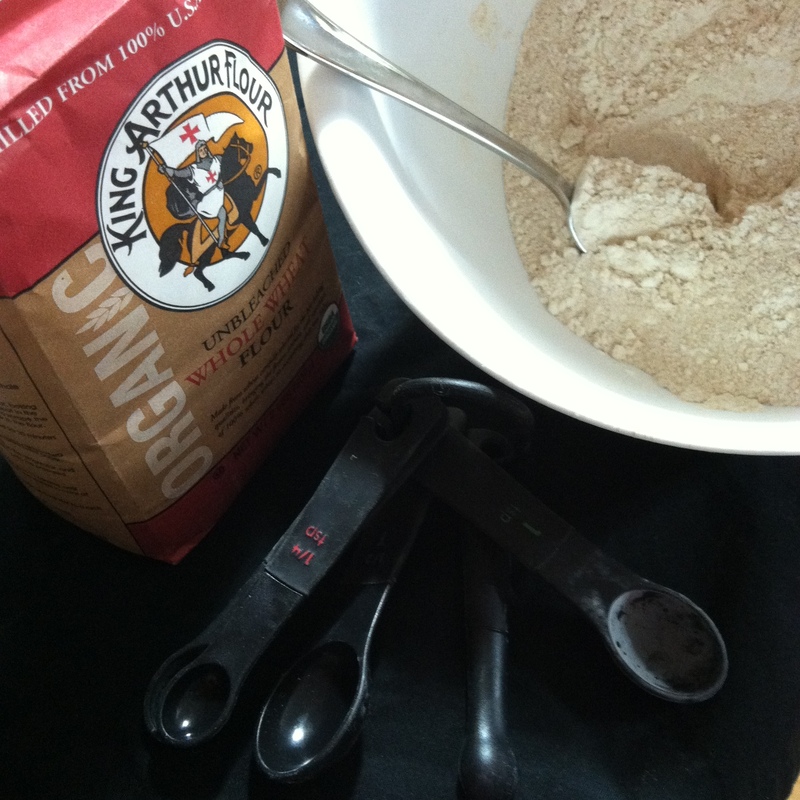 Knead dough again to eliminate air pockets and place back in the bowl for 20-30 minutes. Roll out the dough and lift onto a pizza stone or pizza pan pre-sprinkled with cornmeal. Place the tomatillos into an oiled pan heated on medium. Cover and simmer until they reduce and thicken, stirring frequently. 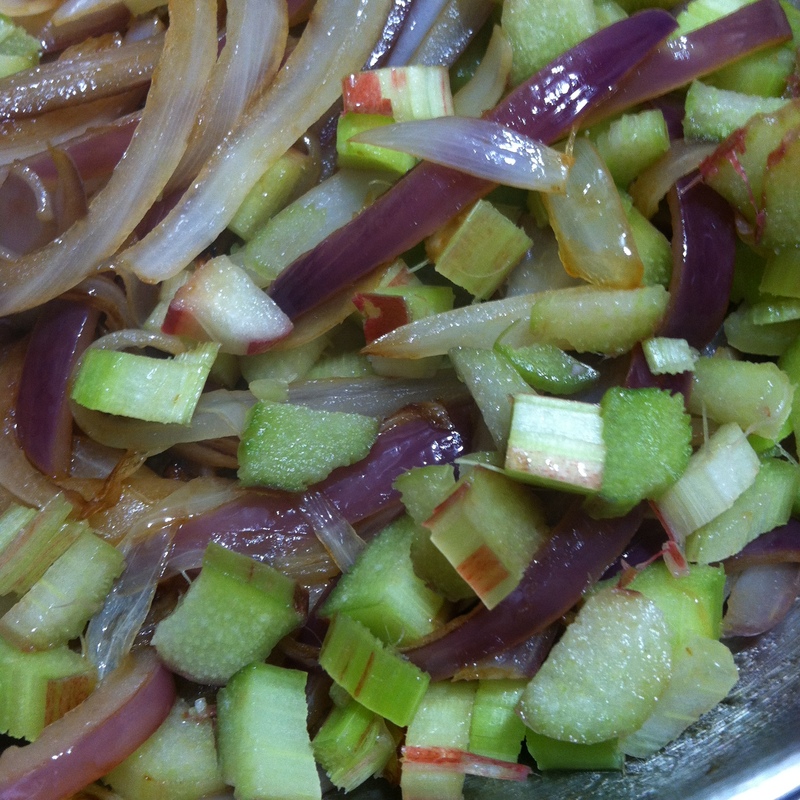 While tomatillos are cooking, place sliced onions in an oiled pan on medium heat, cover and cook until caramelized. 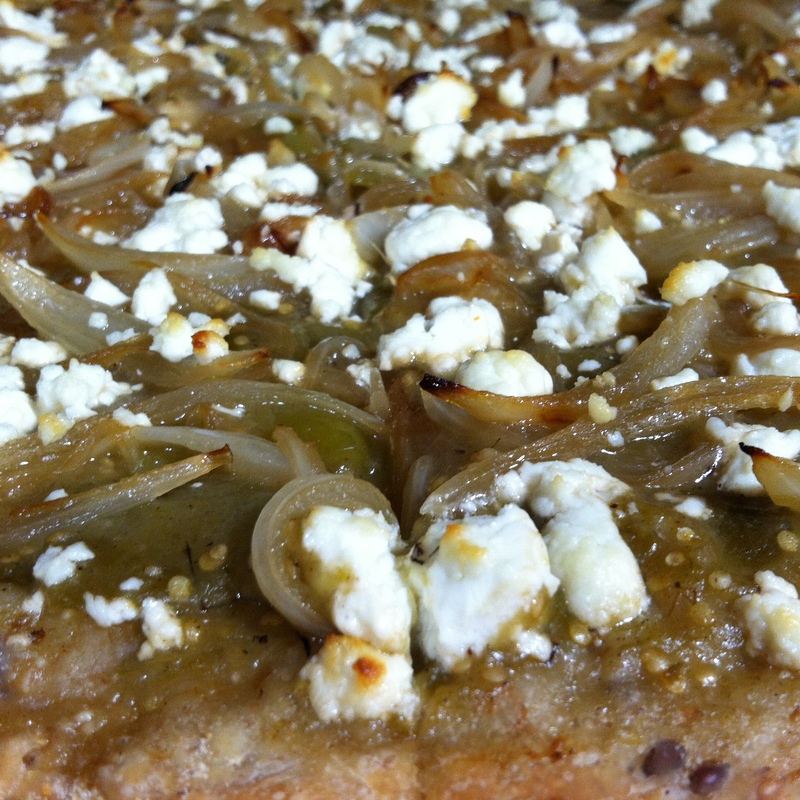 Spread the tomatillo mixture across pizza like a sauce. 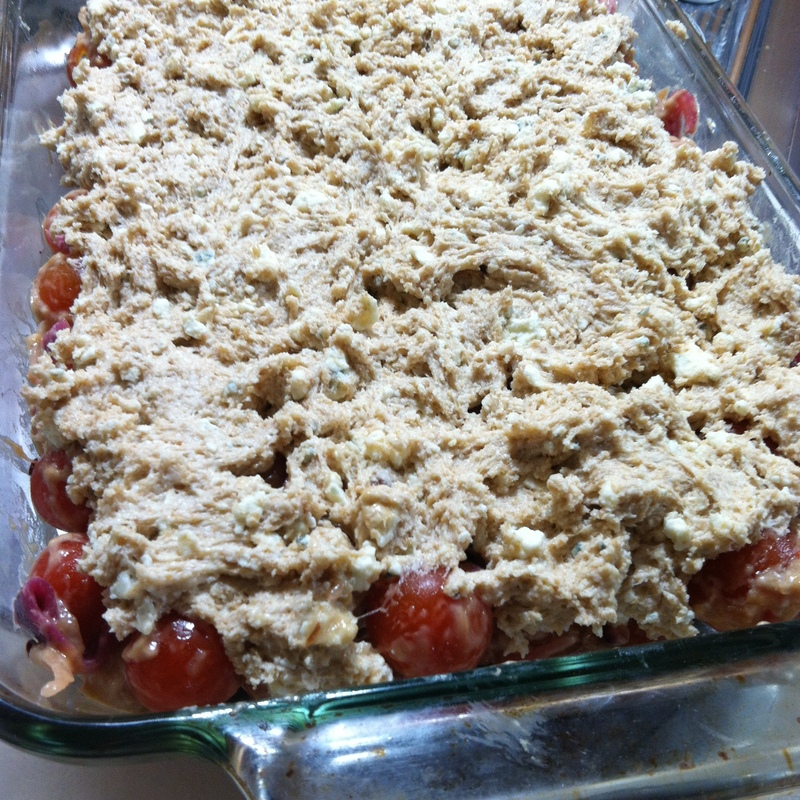 Top with caramelized onions and goat cheese and bake for 10-12 minutes depending on the thickness of your dough. Pro Tip: Along with the flax seed, add fresh basil or dill to the pizza dough to give it a little kick and a little more of that summer flavor! This is truly a quick dinner dish. Perfect for those nights when you’ve worked late and have no desire to cook anything, but have no leftovers in the fridge and no appetite for Annie’s Mac (which is generally my go-to for nights like this). I went straight for the cupboard for this dinner, pulling out a can of corn and a can of pinto beans. Luckily, this is one of those dinners that you can make with pretty much anything you find around your kitchen. I made one for me and one for Mike because I wanted mine to be super spicy. It took about 40 minutes total and really hit the spot! Drain the corn and beans in a strainer and combine. Add a teaspoon of salt and pepper if desired. 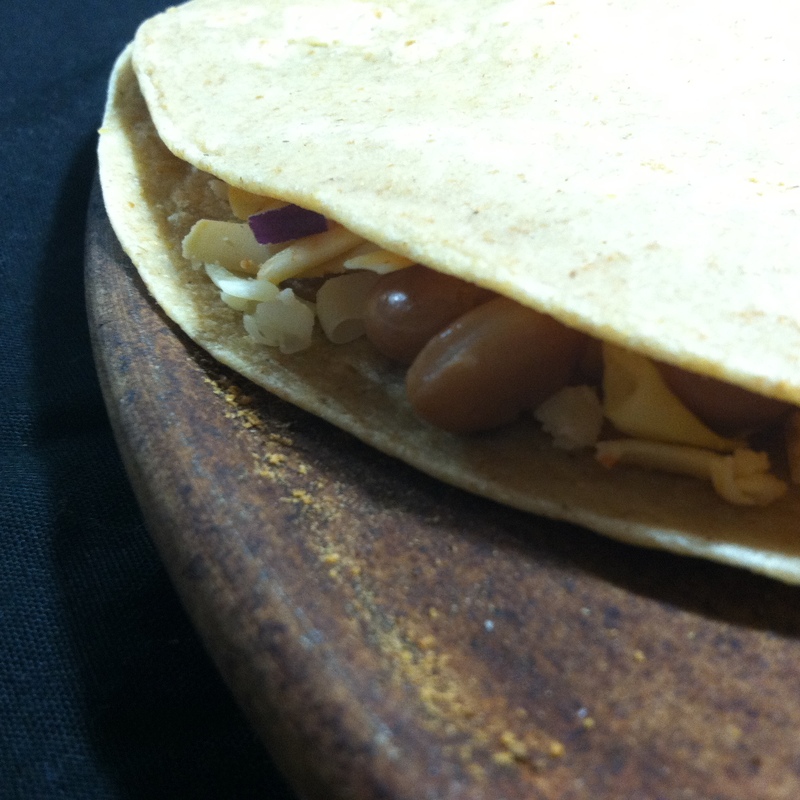 Sprinkle shredded cheese on one half of the wrap OR on one whole side of one wrap. 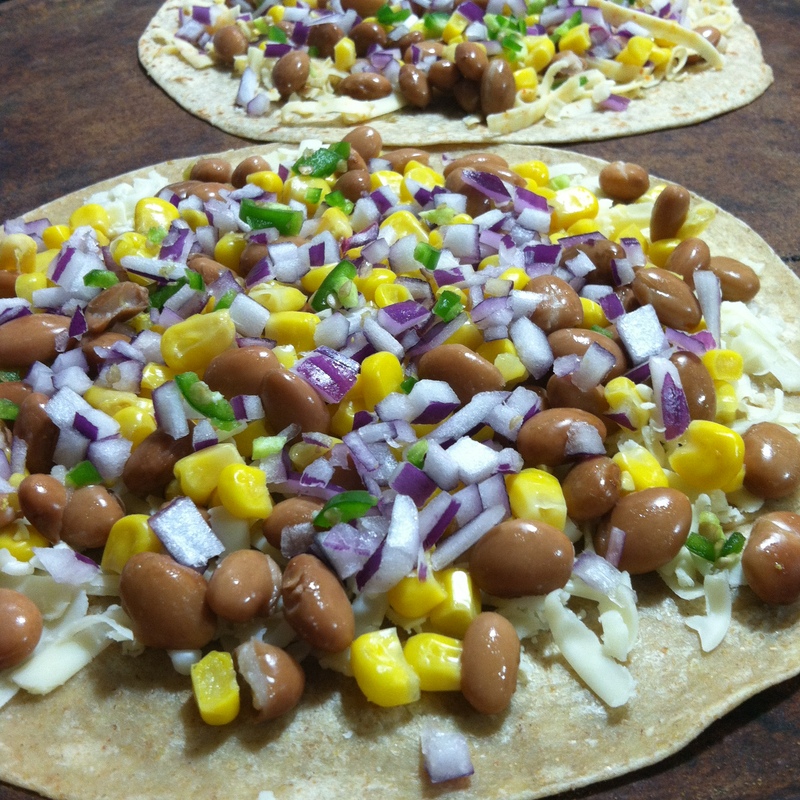 Then sprinkle the corn and bean mixture on top. Add chopped hot pepper if desired. Sprinkle more shredded cheese on top and fold the wrap over to cover it OR place another wrap over it. Place in the oven and bake until cheese is melted and the wrap is toasty. To dress, add salsa and avocado or – to be “fancy”, mash the avocado and blend with some salsa for a quick and easy not-quite-guacamole. Add a side salad if desired and you’re good to go! Pro-Tip: Add chicken if you want! 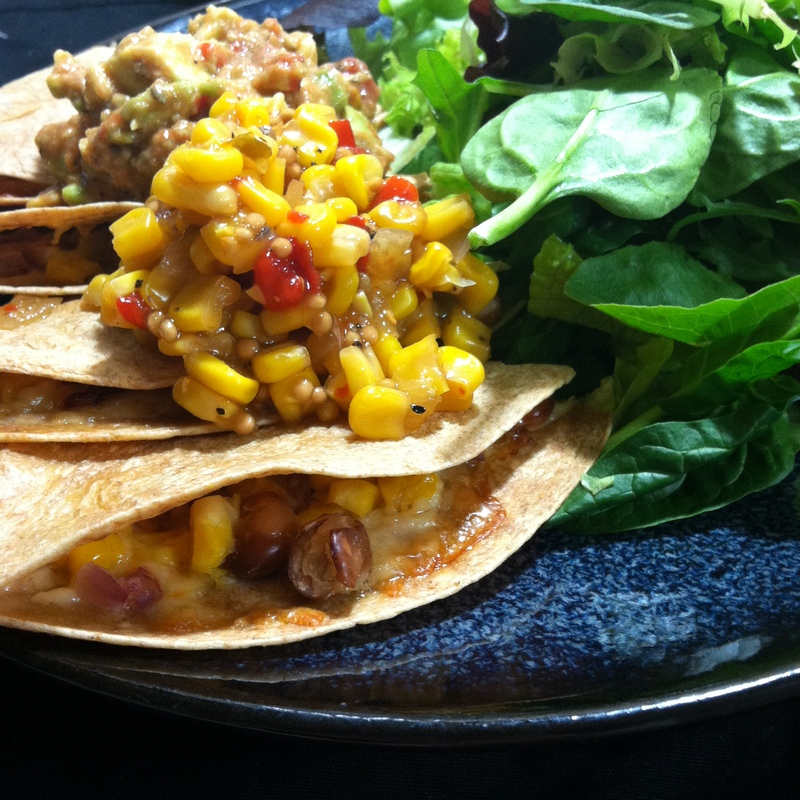 Also, you will probably have leftover corn and beans, so use the mixture to top a salad! 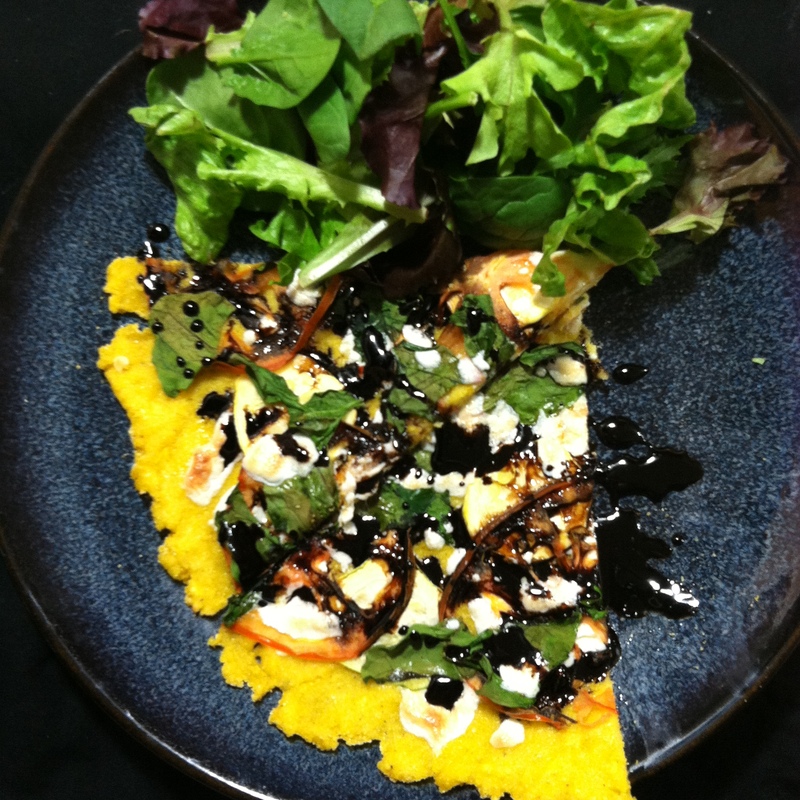 It’s apparently polenta week! Maybe I’m feeling inspired by corn? More realistically, I accidentally bought a brand new bag of cornmeal, not realizing I had not one, but two, already at home. So bring on the cornmeal recipes! Don’t worry, I won’t bombard you. But I’m pretty excited to experiment with it because I’ve only ever used it for sprinkling beneath a pizza crust so it won’t stick to the pan. So obviously you can use whatever you want for toppings, and I definitely plan to make this again and switch out the spinach for basil – yum! Boil the water and milk in a medium pot. When it begins to boil, slowly add the cornmeal while simultaneously (as much as possible anyways) turning the heat down to a slow boil. Stir well to avoid clumping. If it clumps try to just break them apart. Then cover and let simmer for about 15 minutes until it becomes thicker. Add olive oil. Stir until thickened. 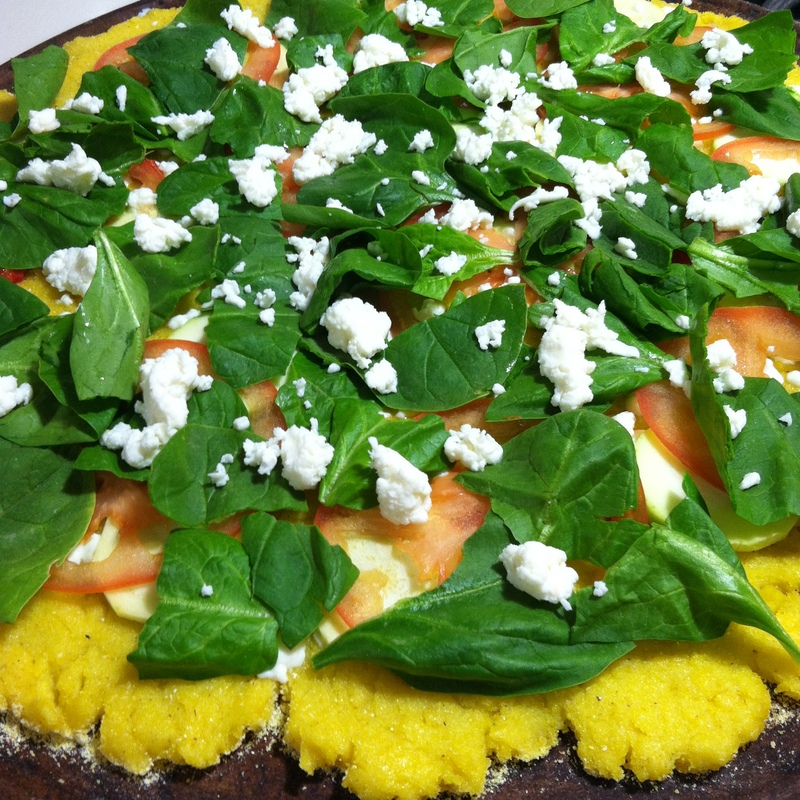 I had to add a bit more cornmeal to make the polenta more of a pizza dough consistency. While this is going on, sprinkle some cornmeal on your pizza stone or pan. 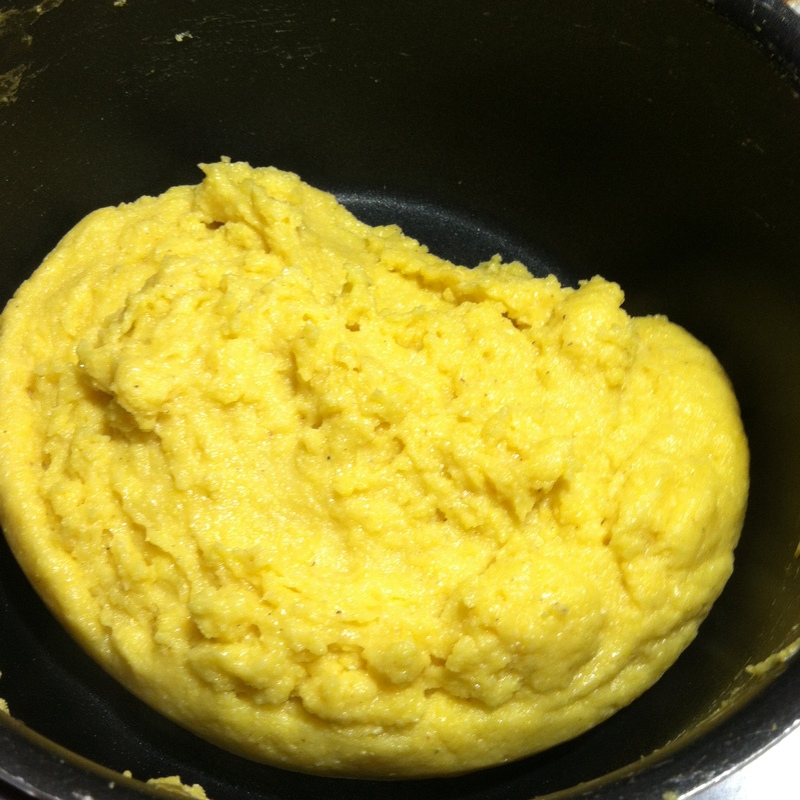 Once the polenta starts moving in a pizza-dough-type ball, remove from the pot. Spread slowly and evenly over the pizza stone or pan until 1/4 inch thick with no rips or holes. I put the whole thing in the fridge for about half an hour to help it solidify more, but I have a hunch you could skip this step. After I took it out of the fridge, I put it in the oven, topping-free, for about 15 minutes to burn off any excess water. Then, it was time for the toppings! Pile them on, then bake for 12-15 minutes! While it’s baking, make your balsamic reduction by slow boiling the balsamic vinegar. This takes 15-20 minutes. It will become syrupy, and you can test the progress by letting it drip off a spoon. Watch it closely once the level gets low because it will burn if you don’t remove it from the heat as soon as it fully reduces and becomes syrupy. Drizzle it over the finished pizza and you’re done! Pro Tip: Unlike real pizza, this one doesn’t taste too awesome straight out of the fridge the day after. 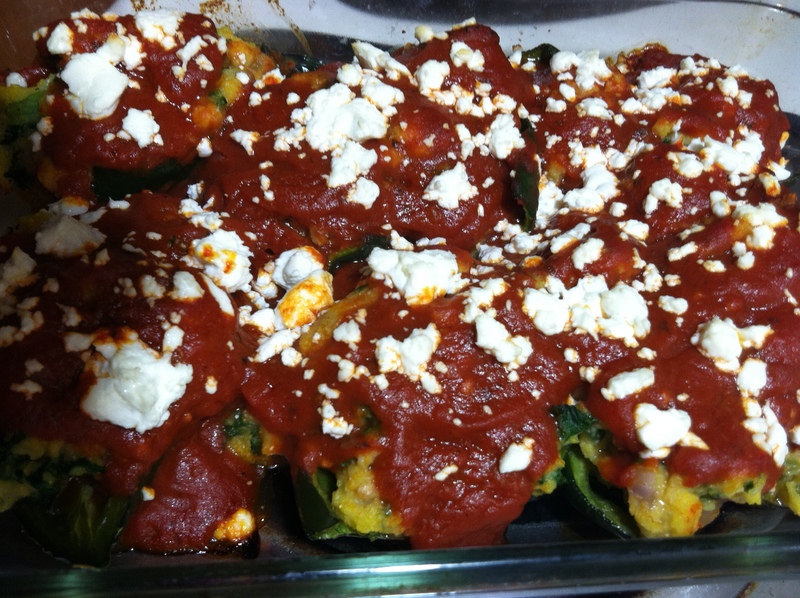 Heat this up in a toaster oven or conventional oven if you can! Microwaving would probably be ok too! It’s that time of the month where I have to do a serious assessment of what’s in the fridge. 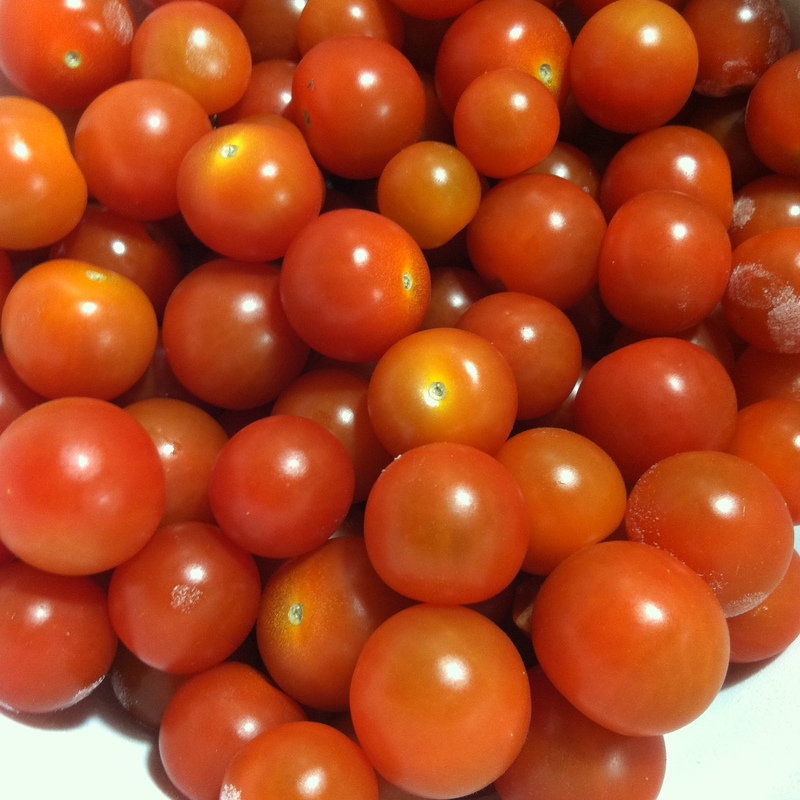 I hate nothing more than reaching into the crisper drawer to grab the tomatoes I bought to make sauce and finding that some – or, GASP!, all – of them have gone bad. My only consolation is being able to feed my rotten food to the worms in my vermicompost bin, but it’s still food I needed for dinner and no longer have! 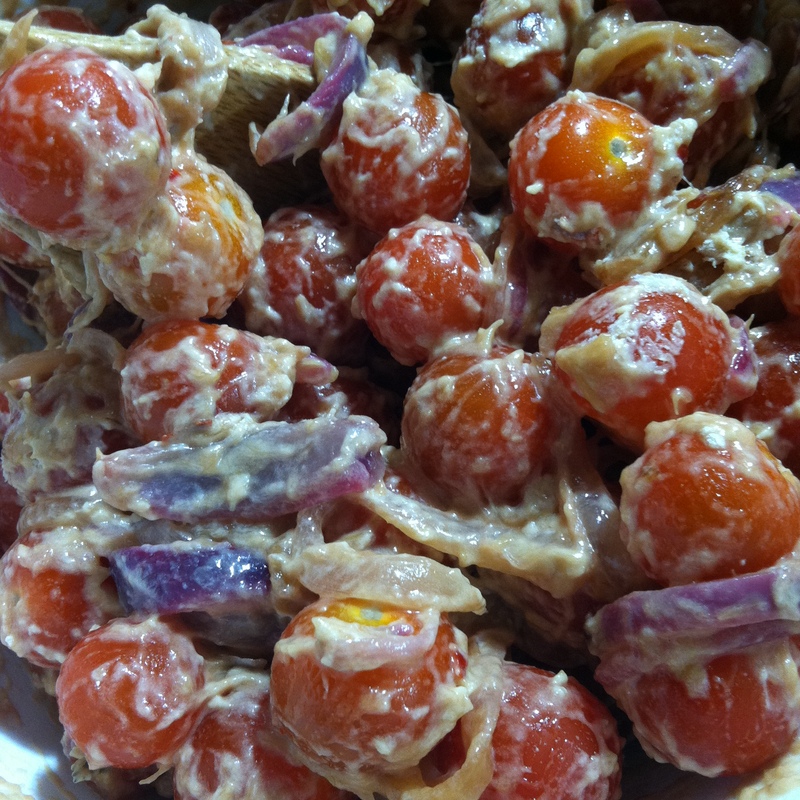 My stray vegetable roundup this week resulted in this comfort food dish that was fairly quick to make and perfect after a long day at work. Boil 2 cups of water. When it boils, add 1 cup cornmeal and immediately remove from heat as the cornmeal will thicken super quick in the bioling water. Don’t be alarmed, this literally takes a matter of seconds. Stir until thickened and add additional water if necessary (I usually have to) to make it creamier. Your polenta should be creamy and easy to stir when complete. Slice the tops off the poblano peppers leaving as much pepper on as you can. Cut the pepper in half lengthwise and clean out the seeds and veins. Lay the peppers out on a baking sheet and bake for about 15 minutes. Flip them about halfway through and take out when the skin starts to pinch. While the peppers bake, warm olive oil in a large pan on medium heat. Add the onion and garlic and simmer, stirring frequently, until translucent and soft. Add any other veggies you want. I added 2 chopped serrano peppers for a little kick and the kale, stirring it until it was steamed and reduced. Add the onion mixture to your polenta, stirring until well mixed. 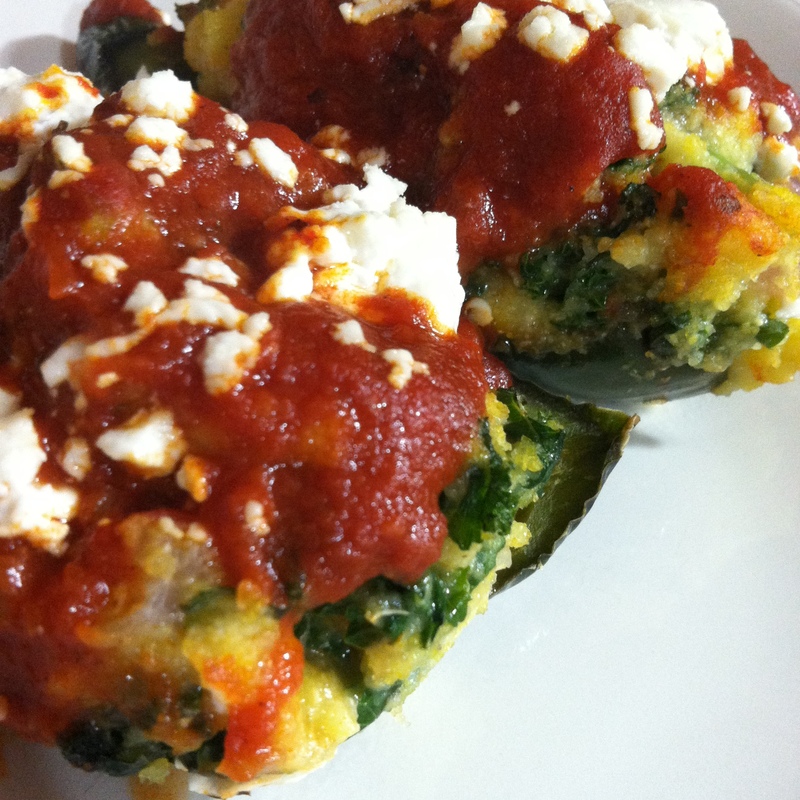 Place each pepper in a baking dish with sides, and spoon the polenta mixture into each poblano pepper. 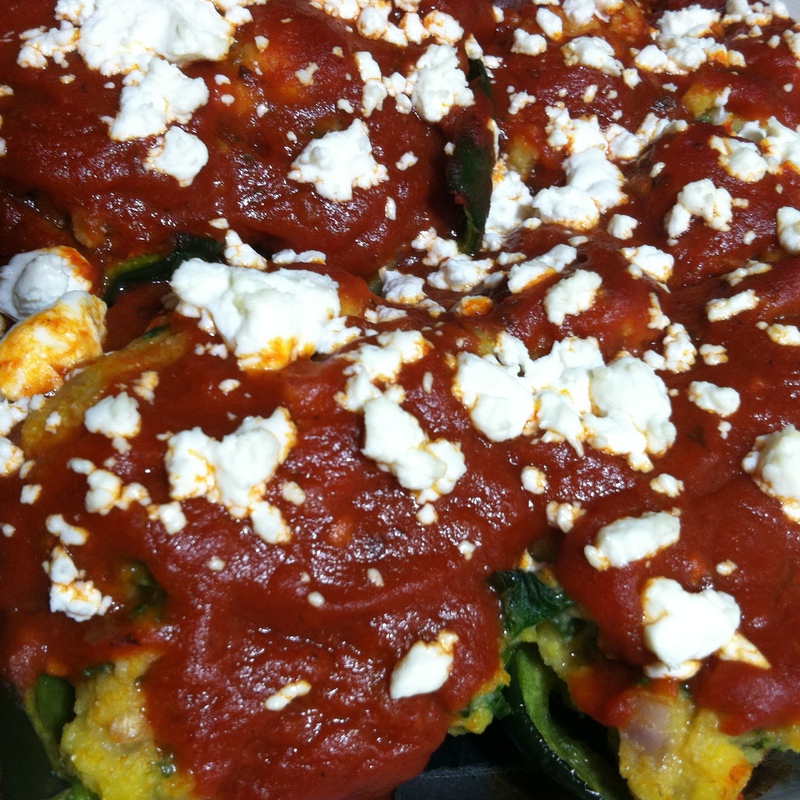 Top with tomato sauce and goat cheese, and bake until cheese is melted. 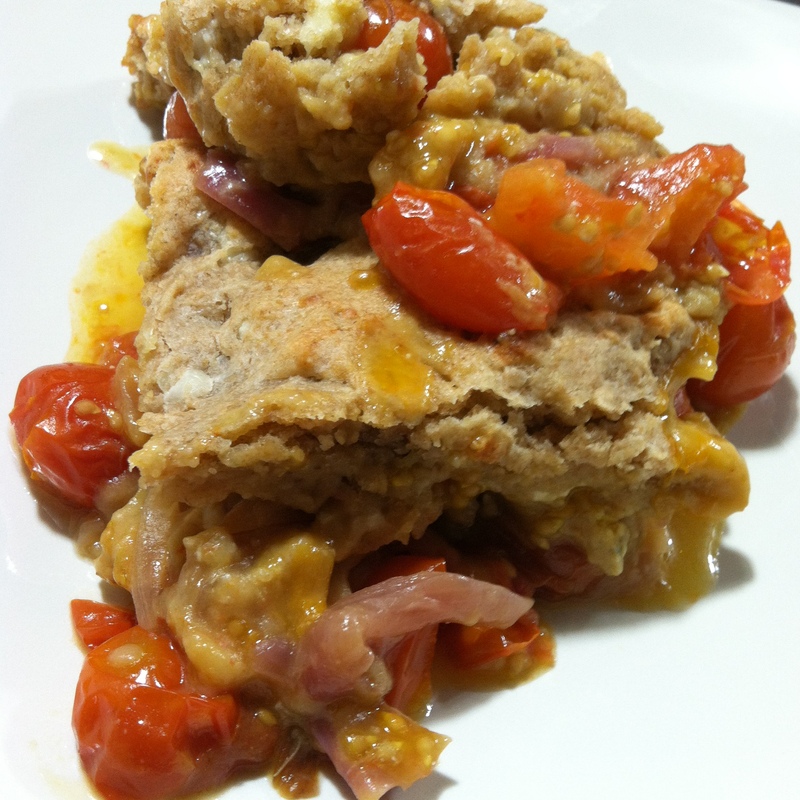 Pro Tip: Consider adding cooked sausage or your favorite kind of bean to the polenta mixture for some protein!